How much does it cost to travel to Venice? How much money will you need in Venice? 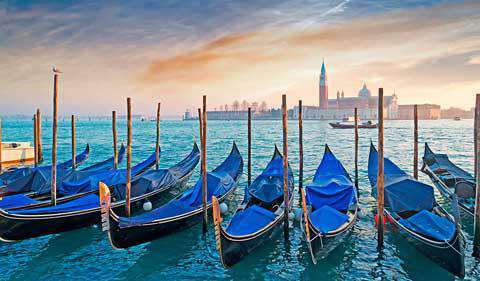 €106 ($119) is the average daily price for traveling in Venice. The average price of food for one day is €29 ($33). The average price of a hotel for a couple is €108 ($121). Additional pricing is in the table below. These average travel prices have been collected from other travelers to help you plan your own travel budget. How much money do I need for Venice? The canals of Venice are one of the most popular and emulated destinations in the world. In it's hay day, Venice was at the center of politics, exploration, arts and architecture. Today that history is still very much alive and well. The city is unlike any other in the world. The best way to immerse yourself in Venice is to get yourself lost in the alleyways. It's actually quite easy to do and you'll find yourself stumbling into the most interesting places, hidden away from the crowds of Piazzo San Marco. Venice is really a city about atmosphere. While there is no shortage of sights, do not lose what you came here for, which is the unique environment and beautiful setting. While Venice can be crowded as a tourist destination, you can avoid much of these crowds if you get up early. Wake up for sunrise and you'll see the city when it is its most beautiful. The dramatic lighting of the sun coming above the horizon creates an absolutely surreal setting, and it is an experience you will share with very few other tourists. It is possible to see a side of Venice that many tourists miss, you just have to think creatively and plan ahead. Spring and fall are the best times to visit Venice. The weather isn't too bad and the tourist crowds are not at a peak. During the winter months, between November and January, you could see a much quieter and peaceful side of Venice, but the weather is usually cold, windy and damp. It can also be very foggy. Summer is the most crowded time, but it is still worth visiting Venice, pretty much any time of the year. Several times a year the water levels in Venice rise and flood the city. This is most common in the colder months and it usually only lasts a few hours during high tide. Sirens sound during the flooding periods to alert residents and businesses to the hazard. Venice is a city for wandering, but while you're wandering, be sure and stop off at some of the must see spots along the way. Of course you can't leave Venice without seeing Saint Mark's Basilica, which is centrally located in Piazza San Marco. Get up early when the light is low and the crowds are thin for the best views and photographic opportunities. Head to Doge's Palace, and also go to the top of the Bell Tower of St. Mark. If you want to do some great day trips, hop on a boat and go to Murano to see its famous glass blowing. Also, the colored town of Burano is absolutely beautiful and a great place to grab a good pastry. Either of these towns can be reached with a short ferry trip. They can also be combined into one days trip together. The historical center of Venice is divided into six districts. These are referred to as "sestieri" and include Cannaregio, Castello, San Marco, Dorsoduro, San Polo, and Santa Croce. The outlying islands in the lagoon as also considered part of Venice. Some of these include Giudecca, S. Michele, Murano, Mazzorbo, Burano, Torcello, Sant' Erasmo. S. Francesco del Deserto and Lido. Mestre, on the mainland is also considered part of Venice. Festivals and events are plentiful in Venice. Some of the most popular include Voga Lona, or a manpowered boat race, Regata 'Storica, which displays historical Venetian boats, the Venice International Film Festival, and of course, Carnival of Venice. Venice also makes for a great base to explore some of the nearby countryside and smaller cities in northeastern Italy. Lake Garda, Verona (for Romeo and Juliet), Padua, and the Prosecco region are just a few ideas. Another great trip is to venture to the Dolomites from Venice to take in the beautiful mountain scenery. There are some very good restaurants in Venice that offer local cuisine. Pizza in the city is considered some of the worst in Italy and is best avoided, but local specialties like polenta and risotto with cuttlefish ink sauce are usually of great quality and highly recommended. After all, Venice does sit on the shore. Restaurants can be hit or miss though, so it is best to do some research and read reviews before you choose a place. In general, avoid the places where there are waiters outside asking for your business. If you're looking for suggestions, here's a thorough guide to finding great food and restaurants in Venice. With so many restaurants focused on tourists, make sure you read some reviews or look for suggestions. One beautiful area to dine is near the Rialto bridge. There is a row of restaurants with tables by the canal. You can eat by the lights of the canal and enjoy a quintessential Venetian experience. Prices can be inflated though, so make sure you look at a menu before choosing a spot. Venice is easily walkable because there are no cars. You can walk around the Rialtine islands, or the main part of Venice, from one end to the other in about an hour. Obviously you will want much more time to explore the sights and get lost, though (and you will likely get lost - it's one of the best things to do). There are also vaporetti, or water buses as well as water taxis that you can take. Vaporetti's are a good way to get around, as they are essentially buses that travel on fixed routes, and they are much cheaper than water taxis. Gondola rides are a popular activity, but these are more for scenic tours than for transportation. You will find them to be expensive, and you should plan to spend at least €30 to €40 or more for a ride. Definitely don't pass up Murano, great for glass blowing, and Burano, famous for it's colored houses that line the beautiful canals. The two towns can be combined into a single day trip, and it's a great way to get out on the water and explore outside of Venice proper. Both towns are quite quaint and lovely. We particularly enjoyed eating some homemade pastries by the canals in Burano. Definitely build this day trip into your holiday and you won't regret it.